Sure, first i removed the foam under the deck laminate so i had a 30mm lip of just the laminate. I then filled the space under the top laminate with an epoxy fairing compound. I then used a router to route a rebate into the deck. I then put in some formwork and placed the polycarbonate lid in place to pour the silicone seal between the lid and the rebate. Hope that made sense. There is a photo of the formwork in place at the start of the post which might help explain it. Hello @michion , after having hesitated for a long time between a box and a hatch type boat, I chose the hatch. I wanted to know if you were satisfied with the password SCANSTRUT ? you put 3: once DS 21 for the three motor phase and the suction of the water, one DS 6 for the discharge of the water and one DS6 also on the bridge for the antenna … that’s it? Hi Manu, They are really good when you dont have to change the supplied seals. Where there is only 1 cable going through you can use the supplied seal and they are perfect. The problem i had was trying to drill three holes into the blank seal provided. The rubber seal is virtually impossible to drill cleanly. I ended up pouring a silicone seal that fits 3 cables and the cooling line. Im happy with the result but didn’t appreciate the extra work, considering the cost of the fitting. thank you for your answer and your explanation, I am in the same editing mode that you 3 + 1 to pass in the blank seal … have you found a system more practical to implement? I finally had time to install the new water pump and pickup. Im also using the Flysky GT2B remote because I couldn’t get the Winning eskate remote to work satisfactorily. Had a flawless run today and got a range of 30 minutes. 55 amps on startup and 40 on the foil, so pretty happy with that. Its pretty comfortable at 75 percent throttle. When I try to increase throttle past that it is quite hard to fight the foil. 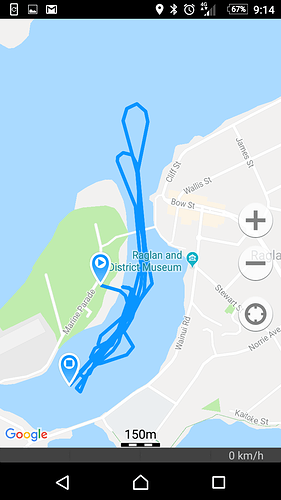 I got a geotracker on my phone yesterday to try and record a top speed. 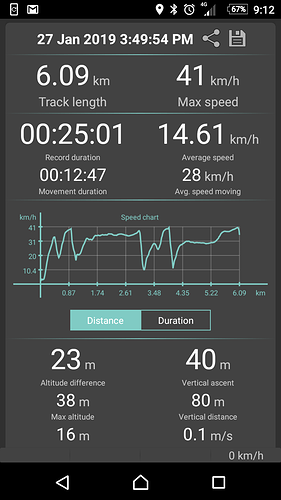 My goal was 40 kph which I thought I wouldn’t quite get. I got 34 kph with the duct on. I had some problems with the duct unscrewing and damaging itself against the prop, so I took it off and had a run without it. I hit my goal. 41 kph top speed. Hurts a bit when you come off. SSS360, Neugart 5:1, 12s, MaB prop 145mm x 305 pitch. Speed run…and crash! 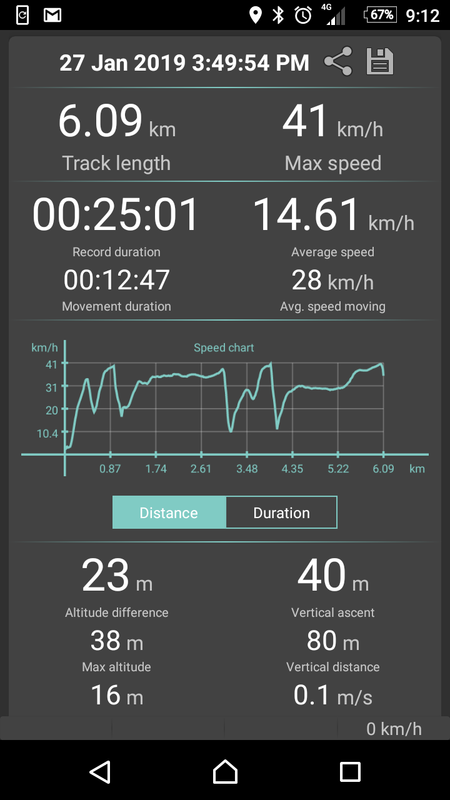 I got my foil to 44kph with a breeze from behind. 6 mm. I can stand on it no problems. We used 4mm, it flexes quite a bit, but works well if there are some internal structures in the cavity that supports it (battery) for example. Wow. Is that Naish Thrust? Or this newish Maolo? I am surprised surf foil can go that fast without being superdraggy. I wonder what kind of wing profile philosophy they had on it. Loved his land kites when it was all about major kite changes back then. Well done! Yes which wing do you use ? And is it “confortable” to put the mast at the rear ? Your right, a surf foil wouldnt go this fast. I used the Naish WS1 Foil. It is designed for windsurf foiling. It has about the same plan shape as a surf foil, but half the profile = Speed. I think its designed for the higher speed and weight of a windsurf rig. And is it “confortable” to put the mast at the rear ? Its a bit deceiving because the foil is a windsurfing foil. They run the mast about 100 mm further back on the fuselage. This is to better align with existing tuttle boxes on windsurf boards. The board gets on the plane easily because it has a fat back end. I think the tail is still about 25 inches across. I though I might have bust my foil in the weekend. Luckily it was just a broken sheer pin. Managed to get some footage of the foil doing its thing too. What size, length and width, is the board? About 6’5" x 30" from memory. Can you tell me what a propeller is exactly. MaB designed it. He is a member on this forum. I really like your build, especially the speed you have gained with the Naish Thrust WS1. I almost bought a Naish Thrust surf foil, which is from What I Can read a slower foil, compared to your windsurf version, with a flat front wing, but with same aspect ratio and Surface area os 1236 cm2. Do you find your WS1 windsurf version easy and stable to ride? May I ask your body weight and How easy/early/low speed your board start to foil?